WILNO – A heavy snow fell outside of St. Mary’s Church in Wilno, as hundreds of people came to bid a final farewell to Barney McCaffrey on January 12. 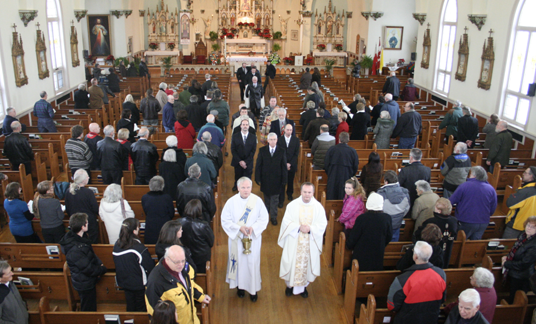 The parish was basked in a solemn atmosphere as well-wishers entered and took their place amongst the pews. The choir accompanied by other musicians and McCaffrey’s long-time friend, Ish Theilheimer, prepared for the ceremony. Muffled church bells rang outside and soon after entered the funeral procession. Accompanying McCaffrey’s remains were wife, Patricia, and sons Daniel, Ammon, Blaise, and Gabriel as well as friends from the community McCaffrey so cherished. The words the “meek shall inherit the earth,” rang clear from the priest as listeners contemplated how much McCaffrey, who lived a simple life gave to the community. Theilheimer spoke a few words on behalf of McCaffrey. He shared that McCaffrey’s charisma consisted of optimism, energy, faith, charity, great and goofy ideas and raw talent. He mentioned that McCaffrey’s philosophy of ‘live simply so people can simply live,’ was an inspiring foundation to a rich life. McCaffrey was an avid musician that seemed to be in the foreground and background of nearly every event that occurred in the Valley. Along with his wife Patricia and four boys he lived a challenging life as a farmer, activist, artist and teacher. Theilheimer shared a conversation he had with Pat Cybulskie, a student at Madawaska Valley District High School while McCaffrey taught there. “Under Barney’s leadership, students at MV took up social action projects and environmental clean ups,” he said. Theilheimer then thanked McCaffrey’s family for sharing him with the Valley which was followed by immediate applause from the audience thanking the family as well. He also read a note from Renfrew-Nipissing-Pembroke M.P.P. John Yakabuski. “Barney was one of those truly iconic, larger than life persons, whose passing leaves a gapping hole in the fabric of his community,” Yakabuski wrote. After the service, the handmade casket containing McCaffrey’s remains was escorted by family and friends toward the front doors of St. Mary’s where they were met by fiddlers and musicians playing a final farewell to the much-loved Valley legend. A bitter cold met people outside, a reminder of who has been lost. But with McCaffrey’s memory in the hearts of those who appreciated him, one can always look to a story, song, photograph or personal anecdote to warm themselves with.